Dietary decisions - is it time to change? Today we are enlisting the help of Lily's Kitchen - makers of natural and nutritious pet food - to discuss how this type of diet can really benefit the health of pets. When it comes to itchy skin, allergies and weight management issues, the quality of the diet often plays the biggest role, which in many ways is a good thing, as diet can so easily be changed. Here, Lily's Kitchen gives us the low-down on how naturally wholesome diets can have a massive impact on the health of cats and dogs and how their recipes are carefully formulated with your pet's nutritional needs in mind. Sadly, scenarios of cats scratching their ears raw or dogs suffering with delicate tummies and bouts of sickness are becoming all too familiar to pet-friendly households these days. But why is this? And can the diet provide the answer? “It all started with Lily, our beloved Border Terrier. She was a typical itchy dog – itchy skin and ears. We tried various things but nothing seemed to make a difference. We had a hunch it was something to do with her diet so decided to cook Lily’s meals from scratch at home and were delighted with the results. No more itching and a very happy dog! We knew there were lots of other pets suffering with the same conditions and we really wanted to make a difference. That’s how our brand Lily’s Kitchen was conceived and we are delighted that so many cats and dogs are thriving on it”. The problem with so many commercial diets these days is the poor quality ingredients they contain, which are often used to fill or bulk the diet rather than delivering any nutritional benefit. Ingredients like meat meal and derivatives, cheap cereals and grains can all play havoc with a dog's sensitive stomach and lead to new health problems or exacerbate existing ones. Diets with low nutritional content and high levels of unnecessary fillers can trigger allergies and problems with the dermis, as Henrietta describes. You'll find that meat meals are often referred to simply as 'chicken/lamb meal' or otherwise grouped under the dubious term 'meat and animal derivatives,' 'dried chicken' or 'dehydrated chicken,' which doesn't give us much insight into the ingredients used. These are generic terms that appears on many pet food labels and actually refers to, rather worryingly, the carcasses of slaughtered animals, which can vary enormously in quality. 'Meat meal' is another controversial ingredient that is non-specific and generally refers to the head, feet, bones, blood and various other tissues, which can exacerbate digestive problems in dogs. It isn't hard to see such deliberately vague ingredients with dubious origins don't constitute an ideal diet. This is where Lily's Kitchen is different.In fact, it was the first company to develop both meat meal and grain-free dry foods for dogs and cats, using only the highest quality ingredients and based on expert nutrition and veterinary guidance. Lily's Kitchen stands out from the commercial diets crowd by containing only healthy, nutritionally-rich ingredients that are free from artificial additives, preservatives, colours and flavours, as well as all manner of cheap fillers such as grains and meat meal which dogs and cats find difficult to digest. 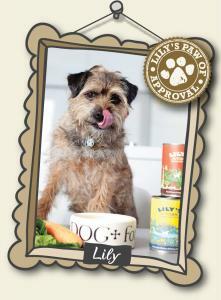 Not only are Lily's Kitchen diets nutritionally sound, but they are highly palatable too! An added bonus, so you needn't worry about satisfying your pet's selective palate or preferences. More importantly, all Lily's Kitchen recipes are geared at promoting optimal health, both externally and internally, including improving coat shine, supporting immunity and a healthy weight, strengthening teeth and improving oral hygiene, and generally promoting healthier digestion. If you have reason to believe your pet's current diet is causing problems, why not give Lily's Kitchen a try? You might be surprised by the difference it makes! is it possible to buy small taster packs to find one that my fussy eater Lhasa yorkie cross might like please? Unfortunately we don't have any taster packs, but maybe if you contact Lily's Kitchen direct they will be able to supply some.